Nic Brierre Aziz joined the staff at NOMA in early 2018 to serve as community outreach coordinator for NOMA+, a new “pop-up museum” that debuted in March. 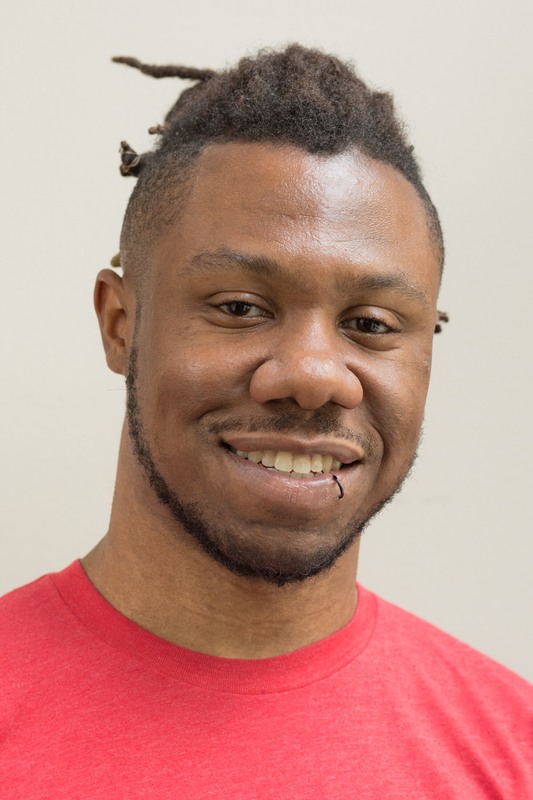 He will write a blog for NOMA’s digital magazine about his observations as this innovative “museum without walls” travels to schools, community centers, libraries, festivals, and other community gatherings in the months to come. Despite the endless number of cultural contributions that minority groups have had in America, they have often been excluded from the overwhelming majority of contemporary art spaces. This exclusion continues to exhibit itself in many ways—whether in regard to museum staffs across the country, of which people of color represent only twenty-eight percent (with most working as janitors or security guards) or museum visitors in which Latinos and African Americans represent nine and six percent across the country, respectively. As a native New Orleanian, I have had the privilege of being raised in arguably the most culturally rich city in the United States and I continue to find new layers of beauty and inspiration within it. I was also blessed to grow up with very large cultural imprints on both sides of my family which only enhanced my ability to understand and appreciate culture as an evolutionary process. My paternal grandfather, Omar Bin-Abdul Aziz, started a renowned business known as Omar’s Pies that existed in New Orleans for nearly thirty years and had as many as three storefront locations during the 1980s. This business, which would turn into a New Orleans tradition, started from my grandfather walking around the St. Bernard housing project selling pies to its residents. My maternal grandfather, Jean Chenier Brierre, was a Haitian immigrant who put himself through school most of his life and did his residency at Yale University in the 1940s. While existing professionally as an obstetrician-gynecologist, he was also an art enthusiast who started a collection of Haitian art in 1944 which has now grown to more than four-hundred works of art. I now have the honor of managing this collection and carrying on his and his home country’s legacy. Growing up around this much culture has undoubtedly had an integral role in my path and love for the arts. In addition to managing my grandfather’s collection, I continue to develop my own artistic practice, which currently includes curation and performance art. I also started a youth writing program in 2016 known as WriteBrained which utilizes the power of writing and traveling as catalysts for self-discovery. My work and passions have always existed at the intersection of art, education and justice, and I am thus honored to lead the implementation of the NOMA+ initiative. As I write this, we have worked with three schools and one community center on the Everyday New Orleans project and look forward to completing this “soft launch” period with our final two partners: Rebuild Center and the Algiers Library. This project has been a local adaptation of the Everyday Africa project and has provided participants with an introduction to photography—particularly as a medium to tell their own stories and combat stereotypes. 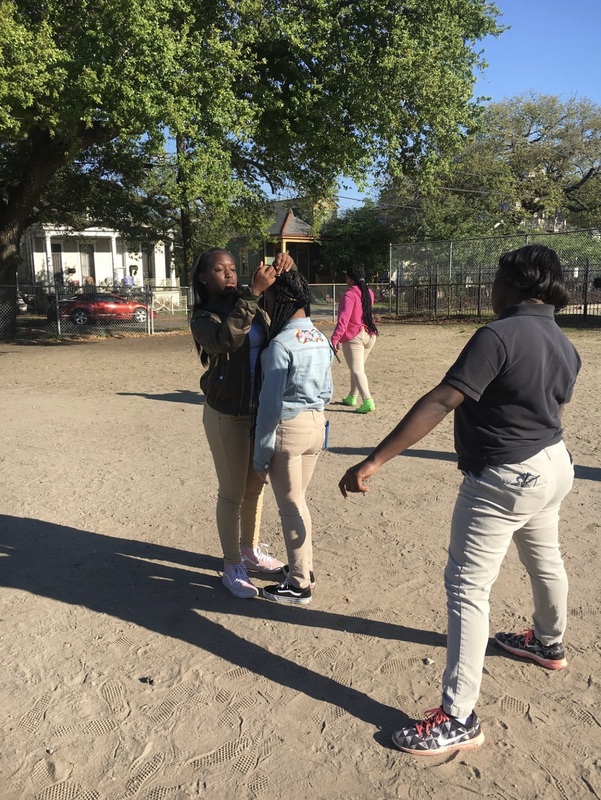 Ultimately, selections from the Everyday New Orleans Project will be on view as part of the Changing Course: Reflections on New Orleans Histories exhibition scheduled to open on June 29 at NOMA. Each site has had two two-hour workshops which I have co-facilitated with a photographer. We partnered with the New Orleans Photo Alliance to select a photographer for each site, and they have all brought their respective skills and experiences to these sessions. For example, New Orleans native L. Kasimu Harris was the photographer assigned to Warren Easton High School where he was able to connect with the students in a unique manner based on the themes of his work and the fact that he is an alumnus of the school. At Esperanza Charter School, this deeper meaning and connection was illustrated through first generation Mexican-American photographer Rolando Palacio’s ability to speak Spanish to many of the twenty-five students who were a part of those sessions. While every site had its individual amazing moments, there was one particular moment at Esperanza that sticks out in my mind and truly illustrates the power of the initiative. The girl in the picture above standing on the chair is named Mya. She was one of the most engaged students from the beginning of workshop one and showed much promise based on the way she was taking photos. 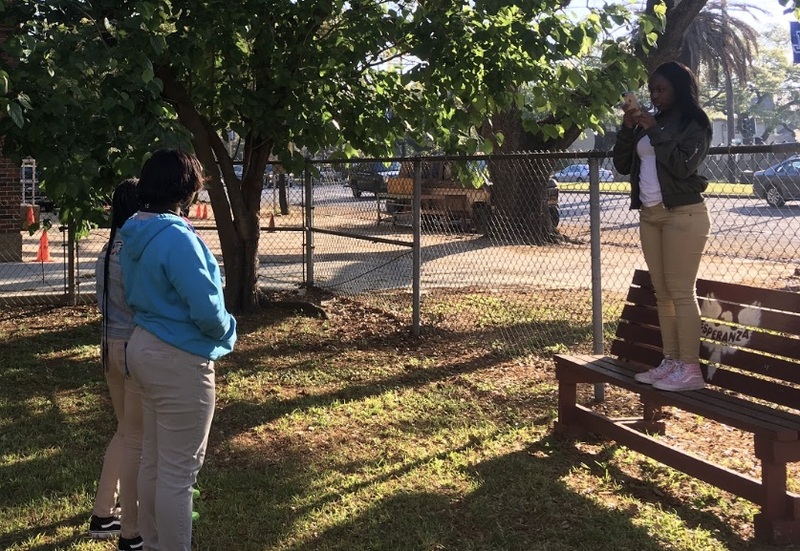 During the second session, I instructed the class to go outside in their groups and take photos with the intent of creating an “exhibition” that they would present to the rest of the class at the end of the session. Rolando and I encouraged them to use the techniques they learned in workshop one and to be intentional about the photos they took in an effort to tell stories and make connections. 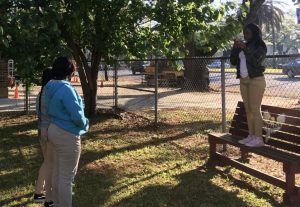 When Mya and her group went outside, they had some initial trouble deciding on what photos to take and how to take them. Mya also expressed that the rest of the group did not want to work with her and wasn’t open to her ideas. After mediating this slight dispute, I told the group how special it was that they were a group of young black girls. I used pop culture references such as “black girl magic” and encouraged them to use the flowers and trees to illustrate a narrative that the world doesn’t see often enough. These mediative words of encouragement seemed to help and the group moved forward with Mya leading the curation of their photos. I immediately walked over and encouraged them to continue with the idea and showed them the work of an artist whose work is currently a part NOMA’s exhibition A Queen Within: Adorned Archetypes. The artist is Joanne Petit-Frére and I was able to show them a picture of her work that I coincidentally shared on my Instagram page last November. I also then explained to them that she had four pieces in an exhibition that was currently on view at the museum. While a very quick and simple moment, it encapsulated so many powerful layers of the NOMA+ initiative. Joanne Petit-Frére is among the designers represented in A Queen Within: Adorned Archetypes. 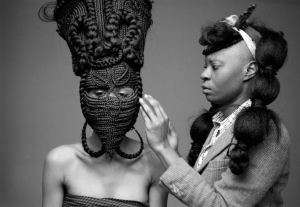 She takes sculpture into new realms with her incredibly complex hair designs, which call upon influences as diverse as math, nature, engineering, chemistry, garment construction, Old World architecture, Africa, and the Americas. The freedom associated with immersing oneself in art practices and experiences is one that has not been as easily afforded to minority groups—especially those of a certain economic status. This restriction and exclusion has been exacerbated by the fact that these faces and stories have also not been promoted in nor given access to so many contemporary art spaces. The irony is that while these groups tend to be excluded from art spaces and may not have as much flexibility to explore these sides of themselves, they often have to be even more creative than others due to their economic or social situations. The NOMA+ initiative has the ability to combat this systemic exclusion—one that has existed in the art world, and nearly every other field of human endeavor in America—since its beginning. I truly see this role as a perfect alignment with my personal mission and am thus so grateful for the opportunity. The contemporary art world is in the midst of an critical period as it seeks to reimagine its historically limited canvas—and I look forward to using the NOMA+ platform to create a more colorful illustration that combats the field’s, and world’s, issues of access and representation. Read more about the creation of NOMA+ in this article from NOMA Magazine and watch the video below for a demonstration of the setup of the pop-up museum trailer.